One of this year’s Final Year Student Projects exposed a group of Third Years to the unforgiving sea off Plymouth. 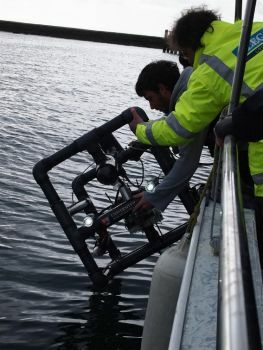 The student’s original challenge was to design and build a remotely operated vehicle and to dive said ROV onto the helicopter deck of the Scylla – an ex-Royal Navy Frigate scuttled in Whitsand Bay in 2004 to be come Europe’s first artificial reef. On-board the diving support boat Venture, and accompanied by Project Supervisors Prof Bob Stone and Andy Dunn, plus Debbie Cracknell from the National Marine Aquarium (with whom the HIT Team has had a long-standing R&D relationship), it was obvious early on that the tidal swell and weather would not allow a trip out to the Scylla Reef. Consequently, the decision was taken to dive the ROV off the old Fort that lies inside the Plymouth Breakwater, which provides relatively good protection from the elements. Whilst the mission was not a 100% success, video footage of the seabed and underwater portions of the Breakwater Fort were obtained. However, the School’s supervisors agreed that the “mission” was an excellent exercise in exposing students to the importance of close-knit team working, to the challenges of systems integration and to the reality of taking complex systems out of the laboratory and into challenging real-world situations.